You don't need to be a golf fanatic to have fun playing mini golf. And you don't even need a golf course, a full set of clubs and four hours to spare. You don't even need to leave the office. Welcome to Office Golf, a variant of Indoor Mini Golf that incorporates your colleagues and place of work. The miniature version of the game, also known as crazy golf and put put, has a long history in the corporate environment but until recent years has been confined mainly to the private offices of senior management officials who negotiate million dollar contracts and hone their putting skills at the same time. Why not take a piece of this office golfing action for yourself and your co-workers by organizing an indoor mini golf tournament in your office. Whether you're out to have fun, raise money for charity or find something entertaining to do during the lunch hour, office golf is a great way to boost morale and stretch your legs. Here I'll show you how to organize your own indoor charity golf tournament between you and your colleagues. If you're anything like me then you've probably been the victim of many misguided attempts by management to boost staff morale with 'fun' games. The problem is that many of these games are quite simply lame and cheesy, or both. Indoor mini golf is a noble pursuit, both fun and competitive. Only the most extreme workaholics will fail to be roused by the prospect of 18 holes on the sacred links of the office golf course. Getting management on board should be easy once you've announced that you want to raise money for charity with your indoor golf tournament. Your company might already have a pre-existing charity day. This poses no threat: just offer to incorporate your golf tournament into it. If they still seem hesitant, promise that all participants will only play during their sanctioned lunch break. If that doesn't work, and your appetite hasn't waned, you'll need to go under the radar and hold a stealth mini golf tournament. Do this at your own risk: neither the writer of this article nor Hubpages accepts liability for disciplinary hearings, written warnings and dismissals. But there's a reasonable chance that your boss is already a diehard golf fan and will jump at the chance of improving office morale and indulging his love for the game at the same time. To raise extra cash for your charity, you could ask your company or the CEO to sponsor the tournament in return for naming it in their honor. Once you've designed your course and assigned par to every hole, ask the office computer geek to draw up a scorecard on Microsoft Excel. Working in close collaboration with the office golf geek (you! ), he could even add the yardage for each hole, just like a real scorecard. Why not get members of the management team to sponsor a hole each? In return for a small donation, they get a hole named after them. Put these hole names on the scorecard too (along with course name). If you really want to give your tournament that glossy professional touch, print off the name and yardage for each hole and attach the sheets to the wall at the corresponding points along the course. Ensuring that the tournament runs smoothly. Upholding the rules and settling disputes. Presiding over equipment and distributing as necessary. Collecting putters and balls from players after their round. Officiating a play-off in the outcome of a tie. Announcing the winner/s and awarding prizes. Send an email out asking golf-playing members of staff if they can provide some balls and putters. If you're organizing a tournament on a 9 hole course, with two players on each hole, then you'll need 9 putters (with pairs sharing a putter) and 18 balls (plus a few spares). You'll need to double this figure if your course features 18 holes. Getting hold of the golf balls will be easy but if you find that you're short of putters, simply limit the amount of players on the course. You could also ask your local golf professional or golf superstore if you can borrow some demo or second-hand putters in return for sponsorship. Markers should be used to avoid collision between balls. Typical ball markers are designed for grass and are unsuitable for indoor golf however a good alternative would be to provide each competitor with a sheet of little round stickers (the ones that are used for color-coding files; you can find them in your local office supplies retailer). The trickiest part of your equipment checklist is deciding on the type of target to use. Digging a standard golf hole into the carpet of your office is clearly not an option unless you own a power drill and harbor a suicidal attitude towards your career. Use a compass to draw a circle on the cardboard to represent the hole (the size of a standard golf hole is 4.25 inches in diameter). Around the inside of the circle draw a series of triangles about 12 millimeters in length with the tips pointing inwards. Using scissors or a craft knife, cut out the jagged interior of the circle. Leave one or two inches of card around the outside perimeter of the circle before cutting it out. This provides stability for the hole and you can fix it to the floor with strong wide tape which will also act as a cushion/ramp so that the ball roles smoothly towards the hole. Finally, bend the inner teeth of the circle (the triangles) upwards at a 45 degree angle. Before doing this, I would advise that you gently score around the perimeter of the circle on the underside with a pair of scissors or a craft knife. This will give greater flexibility to the teeth of the hole, allowing the ball inside with less resistance. You now have yourself an indoor mini golf hole. The triangular teeth of the hole should be flexible enough to allow the ball to role inside and sturdy enough to prevent it from rolling out again. Now take this hole and fix it to the floor with tape. 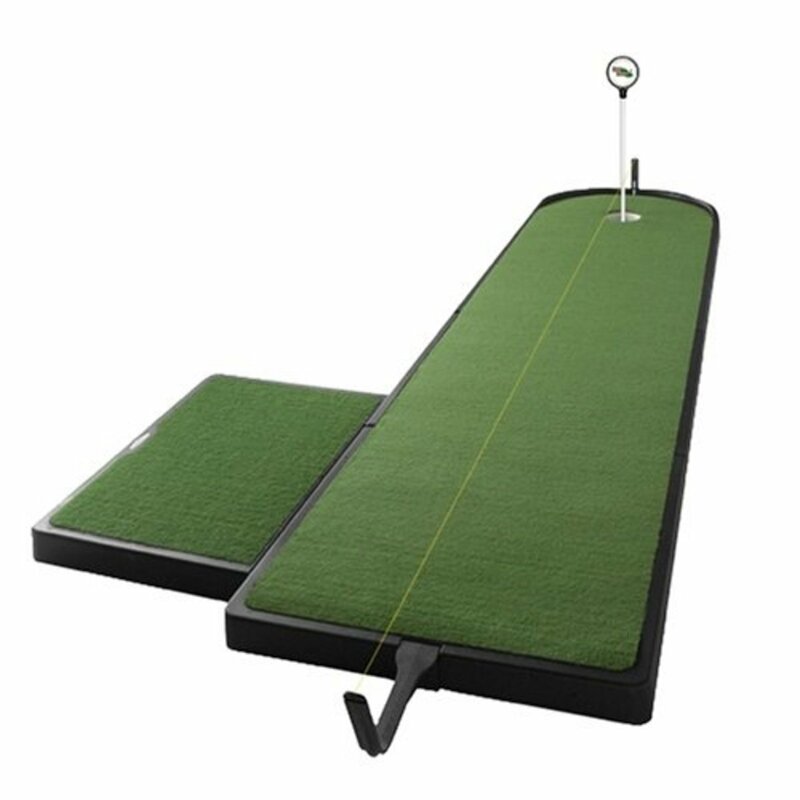 Test it out with a series of putts ranging in length. The key is to create a hole that rewards good ball speed, but punishes shots that are too fast or slow. 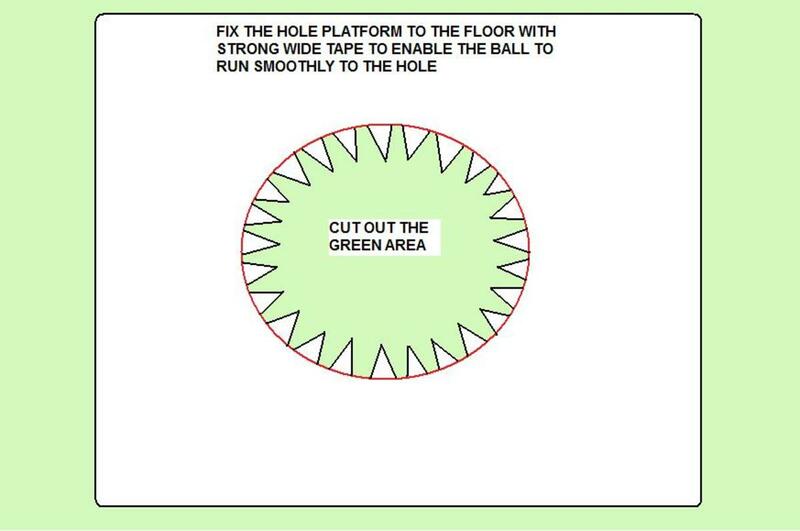 If you find that the golf ball is reluctant to move inside the hole, or escapes from the hole too easily, you'll need to return to the drawing board and make a few adjustments. But if your design works perfectly, repeat the process 9 or 18 times depending on the size of your course (and make a couple of spare holes to allow for wear and tear). Draft a colleague, friend or family member in to help you with this task. If this all sounds like too much effort, you have a few other options. Firstly, you can buy the holes yourself from Amazon (see the Amazon product link above for more information). At $24.95 for nine holes, they aren't cheap but you could probably justify purchasing them using tournament entry fees. A cheaper alternative is to purchase a couple of copies of David Owen's The Complete Office Golf book from Amazon UK for a few dollars. 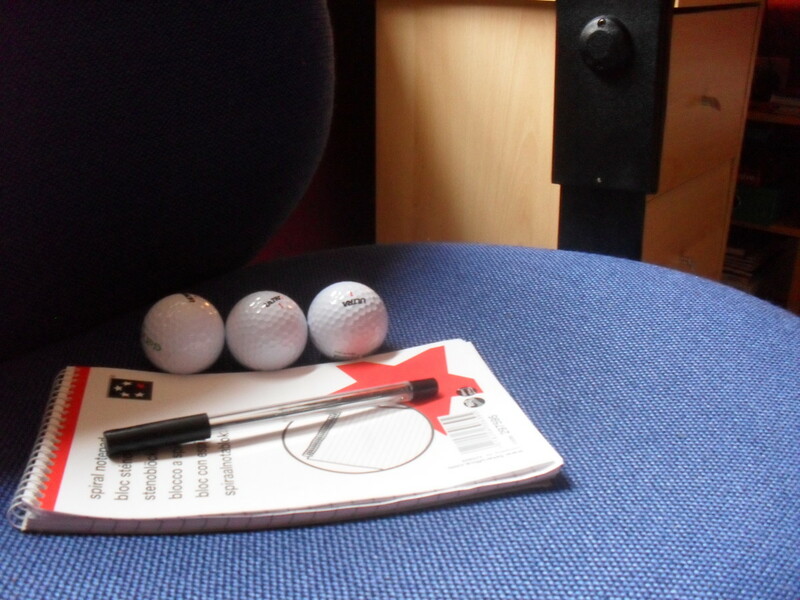 The book includes 9 pop-out holes and plenty of vital information about the art and sport of indoor office golf. Another option is to use a target object such as a coffee mug. If a player's shot comes to rest within a predetermined distance from the mug, for example, three inches, the ball is deemed to have entered the hole. This isn't an ideal solution and can get a little messy and time consuming. With some creative thinking, you might be able to come up with a better idea yourself. If you're hosting a big tournament with a lot of entrants you could update staff by sending the leader board round on the internal email system at regular intervals. For example, every six scorecards that are handed in, an update goes out. This is where you really need to dig into your creative reserves. The great golf instructor, Horace Hutchinson, once claimed that, "the sauce of golf is in its variety". Take these words as your guiding light and strive to design an indoor golf course that befits Hutchinson's quote. Stretch the course out to its maximum potential by using boardrooms, hallways, training rooms, staff rooms; in short, anywhere with a carpet and ample space. Expanding the course beyond a single room adds variety and the short walk between holes helps prevent gridlock. It is worth reiterating that your putting surface must be a carpet (or similar material). Bare floorboards and linoleum will wreak havoc on your tournament and must be avoided. Bring a few obstacles into play. Strategically-placed cardboard boxes, chairs, water-coolers and photocopiers make the course more interesting and encourage creative, thoughtful play. The target hole doesn't have to be in direct view of the starting point. Throw a few doglegs (a hole that changes direction by bending left or right) into the mix. For example, the sixth hole of your office golf course might involve knocking the ball past a table in order to gain a direct shot at the target/hole. Add even more spice to the hole by leaving a small gap underneath the table so that the gung-ho players and risk-takers have the option of a more direct route to the target, albeit, one that is fraught with peril. Ease competitors into the tournament with two or three gentle, straightforward holes. There is nothing worse than running up a big score when your round has barely begun. Save the trickier holes for later on. Before you start the design process, decide whether you want 9 or 18 holes on your course. This depends primarily on how much space you have. And remember, a well-designed course can be used over and over again. Don't forget to assign a par for each hole. This could be anything from 2 for the easiest holes to 4 for the most difficult. 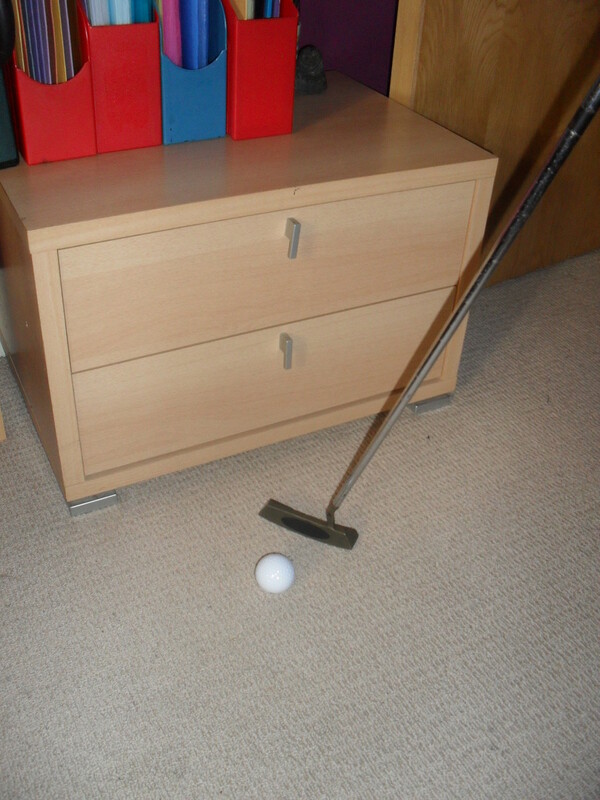 Unlike on a real putting green, being able to read the break (the direction in which a ball rolls) on an office carpet is almost impossible. Test your newly built course before the tournament. If you find that your office floor is not perfectly flat and the ball breaks from left or right, give all competitors the chance to play a practice round. 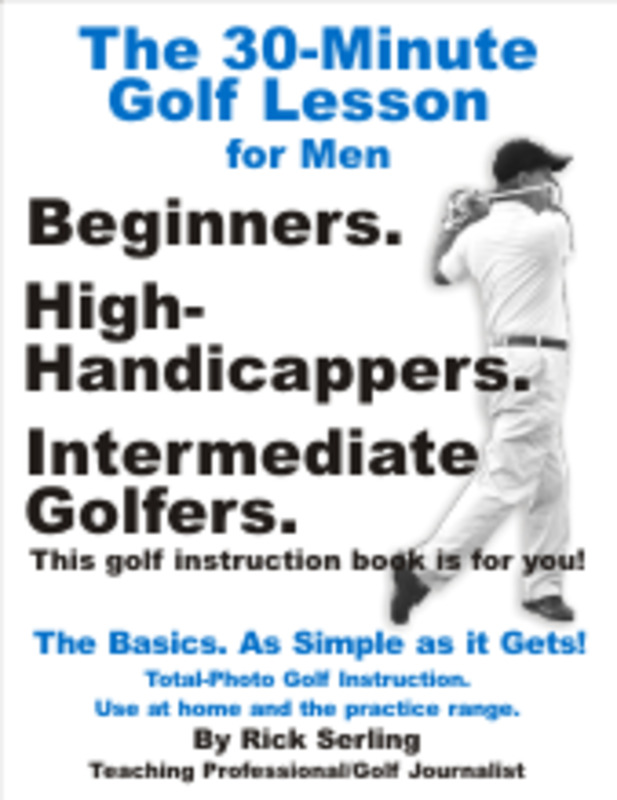 If this isn't practical, perhaps you could prepare a hole-by-hole guide, describing the best places to aim the shots. Maximum of two players per hole. Within each pairing, scorecards are swapped so that each player marks his partner's scorecard. 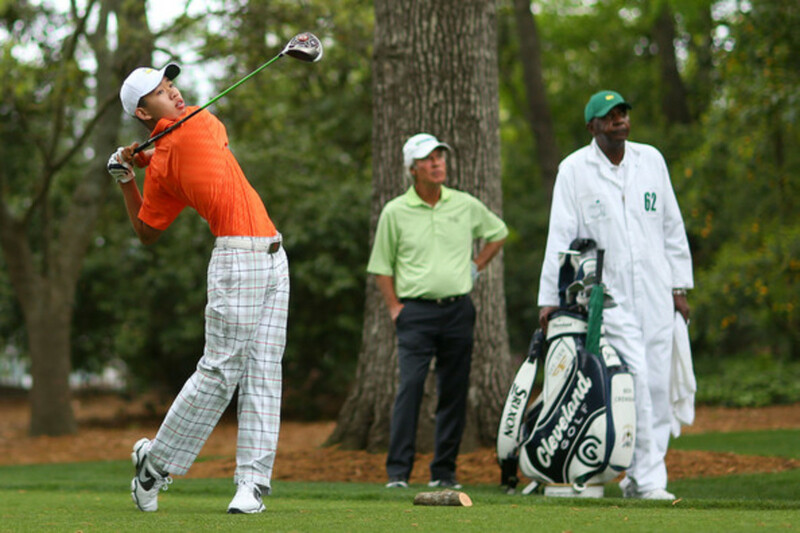 When starting a hole, the player must place his/her ball behind the designated tee maker. If the ball comes to rest in an unplayable position against a wall or other object, the player can move and place the ball into a playable position no closer to the hole without penalty. If the ball comes to rest in an unplayable position because it has rolled underneath a table or other object, the player can move or place the ball in a playable position no closer to the hole and will incur a one shot penalty. Players must sign their scorecards and hand them to the tournament official or steward once they have completed their round. In the event of a tie, a 1/3/9/18 (select as appropriate) hole play-off will take place between the relevant players. The tournament official and/or assisting stewards will settle any disputes and his/her decision is final. The tournament official should run over the rules with each pairing before they start their round. You won't get any entries if nobody knows about it. Advertise your indoor mini golf tournament by putting up posters around the office and sending emails out on the internal email system. If you work in a large office complex and you have the consent of your office manager to invite players from other companies, put a poster up in the building foyer and ask the managers of neighboring firms if you can put posters up in their offices. Tournament name and information about the charity that you are raising money for. How to Enter (email is often the best option; the tournament official can collect the entry money on the first tee, or you can collect it yourself prior to the start of the tournament). Once you have received all the entries, you can pick the playing partners and draw up a timetable with the starting time for each competitor so they know what time to appear at the first hole. Email this timetable back to everyone who has entered. Are you on friendly terms with the neighbors? If your company is based in a large office complex housing several different firms, why not put the word out that you're holding a charity mini golf tournament? Not only will you recruit more players, they might even let you base some of the holes in their office if you're struggling for room. And if your charity tournament is a success, you could even follow it up with an Office Ryder Cup - a team event between your company and the one next door. The money you make to donate to charity from your office golf tournament will come from entry fees and hole sponsorship (see Top Tip #1) minus the cost of prizes and any equipment. If you can entice 100 players into entering your tournament for a fee of $5 each and also collect $5 in sponsorship money for each of the 18 holes from members of the management team, then you've made $590. Even if you deduct $200 for equipment and prizes, that still leaves $390 for your chosen charity. Using entry fees for prizes isn't essential. You might be able to get your company to donate the prizes. Maybe the winner could receive a day's paid holiday with the second place finisher receiving half a day. Perhaps local supermarket retailers will agree to sponsor your charity tournament by donating prizes such as bottles of champagne or wine. Ask and find out. Fancy dress prize for the player in the silliest golfing attire. After the tournament has finished, hold a prize giving ceremony for the winners. You could even present the winner with a cheap trophy to commemorate their achievement. If you intend to run the tournament on an annual basis, ask if you can install a winners plaque on the office wall. Although an indoor mini golf tournament in your office will probably take a lot of organizing, the effort will be handsomely rewarded by your charity fundraising exploits. You'll also have a lot of fun. Who knows where things will go from here? Perhaps your tournament will spark interest in a Charity Pitch and Putt or Par 3 Championship at a local course. In the meantime, good luck with organizing your charity office golf tournament. I hope it raises bundles of cash for your charity and generates plenty of entertainment in the office. Have you hosted an indoor putting contest or mini golf tournament before? If so, I'd love to hear from you in the comments section below. Charity Office Golf - What Do You Think? Will you be organizing a fundraising indoor mini golf tournament in your office? Great idea! My colleagues would love it and I'm thinking about arranging a tournament. Love the idea but i'm not sure my colleagues would be into it. We already play golf in my office! 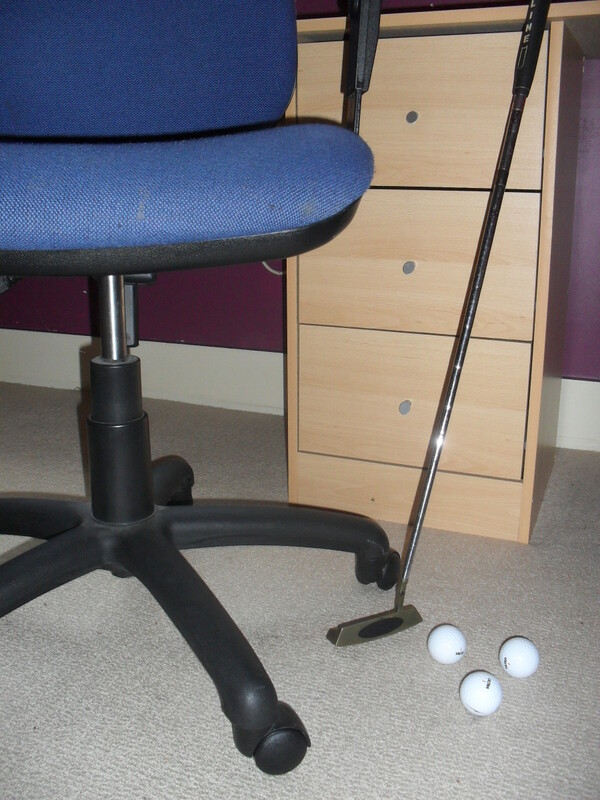 I'd like to play indoor mini golf in my office but there's no way my boss would sanction it. My office is too small. There's not even enough room to swing a putter. Golf cost me my job! I ain't going there again. This is the world's craziest idea but it might just work. Are you kidding me?! This is the world's dumbest idea! Interesting concept. I'll have to think about this one. I'm glad you like the idea mygolfstory. Let us know if you try it out. This idea is perfect. Thank you so much for sharing. What a great way to get people interested in golf and utilize the space that the new "modern office" floor plan is giving so many companies.